In Riviera Nayarit Luxury is our Magic and it will be presented this October 24-26 in Rio de Janeiro, Brazil, for the “Tourism Fair of the Americas”, hosted by the Brazilian Association of Travel Agents (ABAV, just after the success of the Annual LIDE Meeting that was held in Punta de Mita. LIDE is the most Influential Business Body in Brazil. The Conventions and Visitors Bureau (CVB) of Riviera Nayarit will deploy major promotional efforts for this show, as one of the goals for 2012 is to diversify markets. 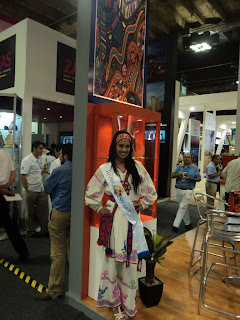 Not only lean on what have been the traditional Tourism sources for Mexico but to diversify and expand to new markets. Achieving an invitation to Brazil’s largest Trade Show for The Travel Agent Industry, is one such step. “Mexico’s Pacific Treasure” will showcase its natural attractions in collaboration with The Mexico Tourism Board, the Huitchol Art, the Ballet Mexcaltitan and the Nayarit Gastronomy, supervised by Chef Betty Vázquez and Café Riviera Nayarit. Meetings with Brazilian Airlines, Tour Operators and Wholesaler Agencies have already resulted in business appointments set for the event, aiming to join efforts and attract Brazilian Travelers to Riviera Nayarit. A special focus will be placed on Travel Agents through a workshop and two Breakfast-Seminar, one in Rio de Janeiro and the other in Sao Paolo, where training Riviera Nayarit as well as Puerto Vallarta will be offered.